Ernest J. Gaines' A Gathering of Old Men takes place in Louisiana one day before a much-anticipated college football game. A white man, not well-liked and known to be a racist, lies dead on the ground with a bullet through his chest. Mathu, an elderly Black man, stands nearby with a gun in his hand. Candy, a young white woman, comes upon the scene and immediately takes action to save the man who helped raise her. She orders all the African-American men in the vicinity to come immediately and to bring guns with them. When they arrive, she tells everyone that she committed the murder. But everyone knows she's lying. And even if she's not, there's no way she would be convicted when there are so many Black men around her. So every man there, each one close to the end of his life, takes the opportunity to stand up for himself and the many wrongs he's suffered by claiming to have committed the murder, and each one has a story to share as to why he did it. 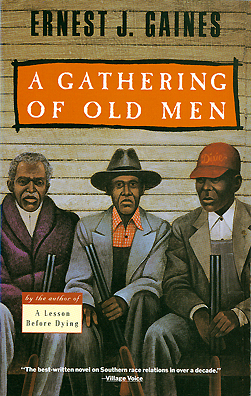 I really enjoy stories told from the POV of multiple narrators, so I was predisposed to enjoy A Gathering of Old Men. I love getting in the heads of characters with different motivations, speech patterns, and memories. I like to see the same character through different people's eyes. I love to hear the same story from different perspectives. While Gaines' story doesn't quite do that - we get multiple POV, yes, but the story progresses chronologically so we don't hear different versions of the events - it succeeds on so many levels that I didn't really mind. It took me a little while to understand exactly what was going on in this story, and I think that's the way that Gaines meant it to be. For the first few chapters, I couldn't sort out who was white and who was black or how the characters were related to each other. Even towards the end, I was unsure of a lot of the relationships. But what was clear from the very beginning was the complexity. For example, Candy assumes that everyone will follow her orders because she is used to having African-Americans do what she says. She uses that power to her advantage to help her beloved Mathu, but that doesn't make the act any less self-serving. Similarly, the victim's younger brother is a football star at Louisiana State. He doesn't want his father to form a lynch mob to go after the murderers- not just because he thinks it's wrong, but also because he doesn't want to risk his chances of being named an All-American. There are many narrators in this story, though none of them are central to the plot. Sometimes it got difficult to tell them apart because there were so many and we were with each so briefly. But I didn't mind that. Gaines accomplished an impressive feat in this novel, taking on the voices and reactions and motivations of so many characters. I loved the way he portrayed the police force, and I loved the way he described the old men. The chapter told from the POV of the barkeep was excellent. But mostly, it was wonderful to be inside a man's head as he made the decision to stand up for himself and defend himself, even when he knew that things were very unlikely to go in his favor. There was so much dignity, so much redemption, and so much absolution in these individual, private acts. A wonderful story written by a master storyteller. I'll definitely be reading more by Gaines! From the way you describe this story, it sounds like one that leaves a huge impression on its audience, and even reading the summary on this one makes me want to check it out; not to mention the way you felt about it. I hadn't heard of this book before, but now I want to actively seek it out. Great review today! I am so glad that you exposed me to this one, and that you loved it. This sounds very interesting and like something I would enjoy reading. Thanks for the review. I'm adding it to my wish list. As you know I loved this as well! You make this sound awesome, but I wasn't a fan of the Gaines that I've read. This sounds really good, the structure and basic idea especially. I like how you say the story moves on, because so often when this sort of concept is employed you keep going back to the start. This sounds fascinating, I'll have to hunt down a copy! This is one of my favorite novels of all time, though I haven't read it in over 20 years. Thanks for sharing this terrific review. Ah, sounds amazing! I haven't read any Ernest Gaines, in spite of his being from the home state, since high school, and I've never read this one. I think I will make it one of my Christmas reads, because I'm almost certain my parents own it. PLAN. Sounds like a powerful story and an interesting way of telling it. I've never read Gaines before, but may have to try this one. I've never heard of this book before but it sounds really wonderful. I have a deep and newfound appreciation of Ernest Gaines ever since I read his book A Lesson Before Dying, which was so utterly beautiful and moving that it made me weep so hard. I just added this to the wish list, thanks. I was toying with the idea of reading one of his books earlier this year and wasn't sure where to start: you've solved that "problem" for me, as this sounds like just the kind of book that I love.